Count De Grasse Delivering his Sword to the Gallant Admiral Rodney, Thomas Cowley, 1782, National Maritime Museum. 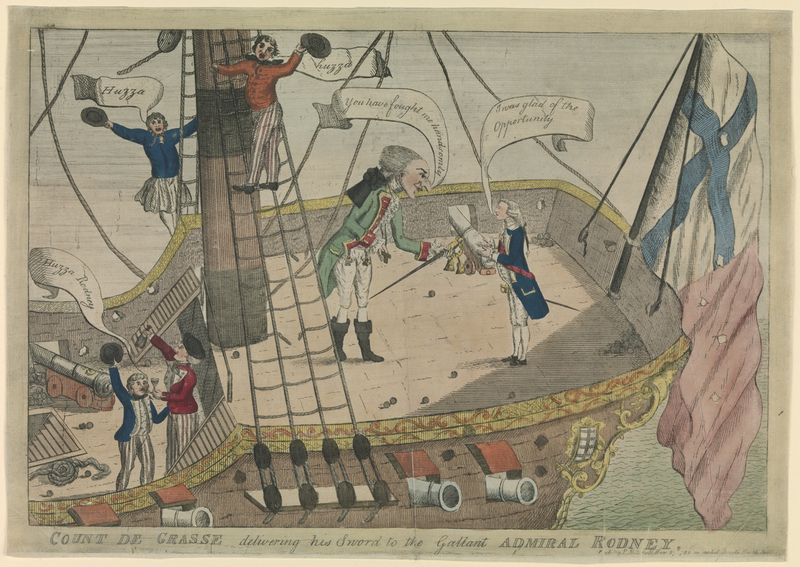 This political cartoon depicts the surrender of Count de Grasse following his defeat at St. Kitts, and again at the Battle of the Saintes. 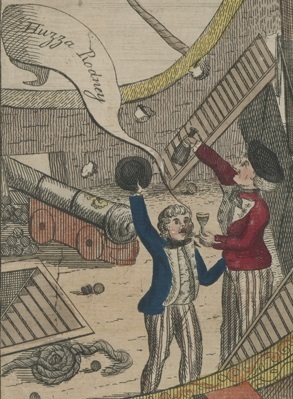 Admiral Rodney accepts his sword on the quarterdeck of a warship that has seen a stiff action. Balls are scattered about the decks, and holes have been ripped through her hull and ensign. 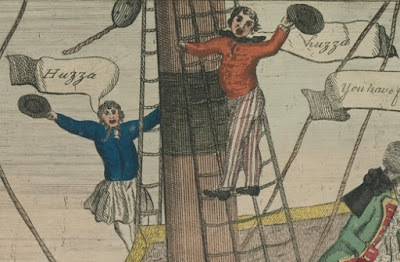 On the weather deck a pair of sailors toast their Admiral with a bottle and glass, shouting "Huzza Rodney!" The cry is taken up by the tars on the ratlines: "Huzza!" Particularly after the embarrassing defeat at Yorktown, an American and French victory enabled by de Grasse's fleet, the capture of the French Admiral was a major boost in the flagging morale of the Royal Navy. The sailors drinking to the health of their Admiral are gathered by the mizzenmast on the deck. Both have round hats with short brims, wear black neckcloths, double breasted jackets, and striped trousers. The tar on the right has slash pockets at the waist of his red jacket, but his mate's blue jacket does not. In the starboard ratlines of the mizzenmast, another tar waves his round hat in celebration. He wears a blue jacket and a black neckcloth. He also wears petticoat trousers and white stockings. At about the same height on the larboard (port) side is another jack in the ratlines. He too waves a round hat, and wears a black neckcloth, striped trousers, and double breasted red jacket.